As the Juno spacecraft is elevated by a rotation fixture, a technician at Astrotech's payload processing facility in Titusville, Fla., examines the installation of blankets on the aft deck. The image was taken on June 16, 2011. 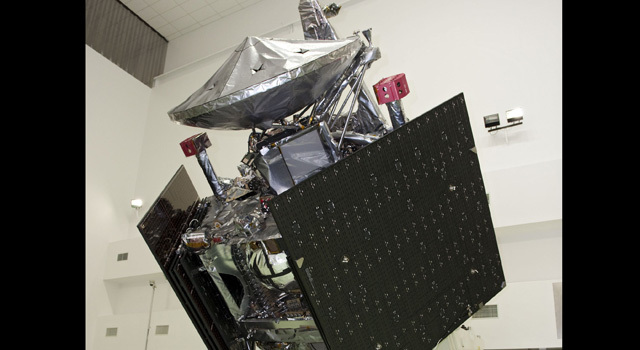 Juno is scheduled to launch aboard a United Launch Alliance Atlas V rocket from Cape Canaveral, Fla. on Aug. 5. The solar-powered spacecraft will orbit Jupiter's poles 33 times to find out more about the gas giant's origins, structure, atmosphere and magnetosphere and investigate the existence of a solid planetary core.